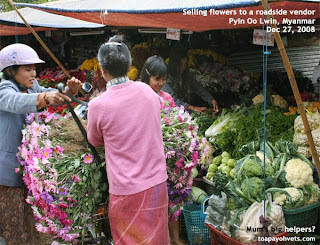 Pyin Oo Lwin's best hotel would be The Governor's House. It is recreated as the original was burnt down during World War II. There is some dispute as to whether the British colonial masters burnt it to prevent the Japanese military from occupying it or whether it was the Japanese who did it. 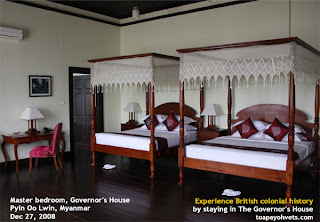 The spacious master bedroom (picture) would have been the one lived in by The British Governor during his escape from the heat of Yangon during summer. During the peak season in November to April, the rental in the Governor's House can be as high as US$300 for the bigger room. There are chalets or small houses available for rent at a much lower rate. Those living in the chalets have their own breakfast room. Lovers of architecture and history would appreciate seeing if not living in The Governor's House. My camera lens malfunction as it can't focus. I was confident of the Canon brand. I bought the camera, Canon EOS 40 in July 2008. Just 7 months ago. I used the camera almost every day. No problem in focusing, till around December 24, 2008. I had thought of buying a lens with a longer zoom but it costs $1,000. It will be heavy to bring 2 lenses for this tour. I did not think that the Canon camera would fail me. Well, it is an expensive lesson as photographs after Dec 24 were not sharp. It would be better to bring 2 cameras. Branded cameras are not what they used to be in reliability. A back up camera must be available. Several competitors. I often wonder how they can sell all their perishable goods and how the smaller ones compete against the bigger ones with more goods. They are all selling the same agricultural products. Why are their customers? Do the smaller vendors with fewer products have loyal customers to survive? Is there severe undercutting of prices? 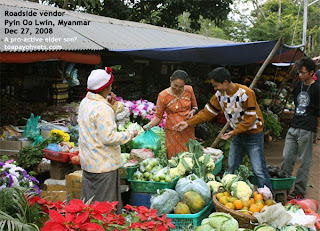 My Myanmarese friends tell me that there is bad economic recession in Myanmar. In recession Singapore, many companies just have to bring down their prices in order to secure a sale. Or they retrench their staff. Newer companies may charge 50% lower than older ones. At least in Myanmar, the villagers can still survive if they are farmers as they don't consume a lot like people living in developed countries. I was talking to an unemployed dog owner who wanted to put his 15-year-old dog to sleep. The dog was blind and had difficulty breathing. It was humane to put an old friend to sleep to relieve his suffering. Could the dog live a year more if money was not tight? The 28-year-old man was retrenched as a manager of a dormitory for foreign workers. The owner of the dormitory had many bad debts as construction companies stop or delay payments and therefore let him go. "Foreign workers used to be sent back home if they complain," he told me. "Now, they band together to get the newspapers to publicise their plight of being abandoned and not paid by the employers to the MOM (Ministry of Manpower).